One of my favourite parts of this time of year! Thanks for this Raili! 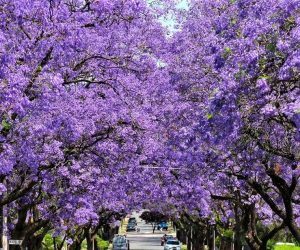 It’s that time of the year when many of the streets in Adelaide are coloured purple. As the flowers fall the streets below are carpeted in purple. Simply stunning, the flowering jacaranda is known by students to be the harbinger for end of year exams. Jacaranda mimosifolia, if grown from seed, can take anywhere from seven to fourteen years before it flowers. For a jacaranda tree to be considered ‘mature’ it is probably twenty years old. They can live up to 75 years and grow as tall as 50 feet. Interestingly, the jacaranda is not native to Australia. They found their way here from Brazil. However, our climate seems to suit them very well as they thrive here. Let your eyes feast on the beauty of nature. It feeds the Soul. They really are! We have them in the towns of our area too. Just divine.